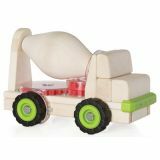 Large wooden (beech wood) cement toy truck with plastic parts teaches children about simple machines: gears. 5 working gears connect the wheels of the truck to the cement mixer. 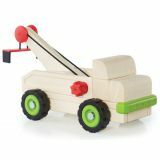 The cement mixer will rotate when the truck is pushed forward or pulled back. Designed to be used with Unit Blocks–Unit Blocks not included. 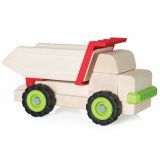 Large wooden (beech wood) toy dump truck with plastic parts teaches children about simple machines: levers. Movable bed for loading and unloading. 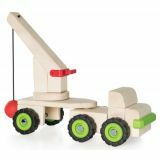 Removable trailer with large wooden crane. Crane rotates so a child can align the wrecking ball with their unit block structures. Articulating trailer allows the truck to make sharp turns. 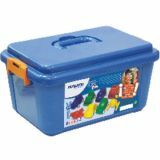 The complete classroom block play accessory collection! 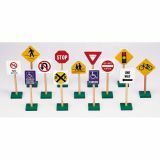 This 36-piece wooden block play set encompasses all the vehicles, signs and people necessary to complete the Roadway System and Community Buildings sets (sold separately.) 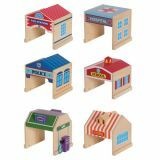 Includes 6 vehicles, 12 traffic signs, 3 traffic barrels, a mailbox, 6 community workers and two separate 4-piece family sets. Mix and match these everyday heroes for some super-silly community play! 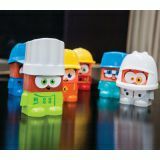 Use to introduce kids to professionals in their community or combine with any of the Super Blocks sets to maximize the fun. Includes 6 characters and 6 hats, plus stand-up photo cards to help children relate each profession to its corresponding workplace and clothing. 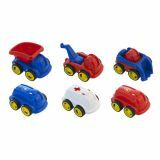 Playing with vehicles promotes physical activity and the development of imitation, helping toddlers to develop their language skills. 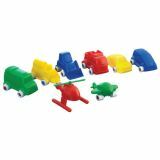 Made of flexible, durable plastic with non- removable safety wheels. Comes in a reusable jar. Measures 4 1⁄4". Ages 12 months and up. 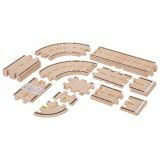 Set includes varied sizes and shapes for countless roadway configurations! Durable, hardwood veneered pieces are 5" wide and can be easily put together and taken apart like puzzle pieces. 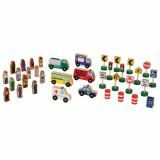 Ideal for large group play, the Roadway System builds teamwork, cooperation, and sharing, while enhancing creativity and problem-solving skills. Sizes range from 2 1⁄2" to 15" long. 42 pieces. Ages 2 and up.